I started on this idea a few years ago. Been thinking more lately and would like ideas/suggestions to continue the machine. I am trying to make a steel track, hydro. drive garden creeper. I need it so I can sit on or lay down to drive down the rows to plant/weed/harvest. would like it to straddle 1 row and be 3 or 4 feet wide, track to track. Have 1 track an sprockets kinda set up, no undercarriage bars yet, and need it strong enough to stand short turns at row ends. Pic of what I have so far. Track pads 4" skeleton style tracks. Don't mean to disparage at all what you have done so far. But perhaps to offer a different perspective. The reason "tracked" vehicles work so well in rough terain is that they spread the load -and traction- over a much bigger area than wheeled vehicles could possibly approach. Generally thought of such machines tend towards Catapillar type -steel tracked- vehichles. But such vehicles are inherently heavy and require big high torque engines. Not necessarily best for a small farming environment. Before my health got in the way I was gathering parts and contriving plans to build my own tracked vehicle that would be rather a hybrid between an Iron horse and the bigger but slightly different snowcat vehicles. Using truly dirt cheap pneumatic HF wheels as boggies and narrow (5 inch wide) rubber conveyor belt material. 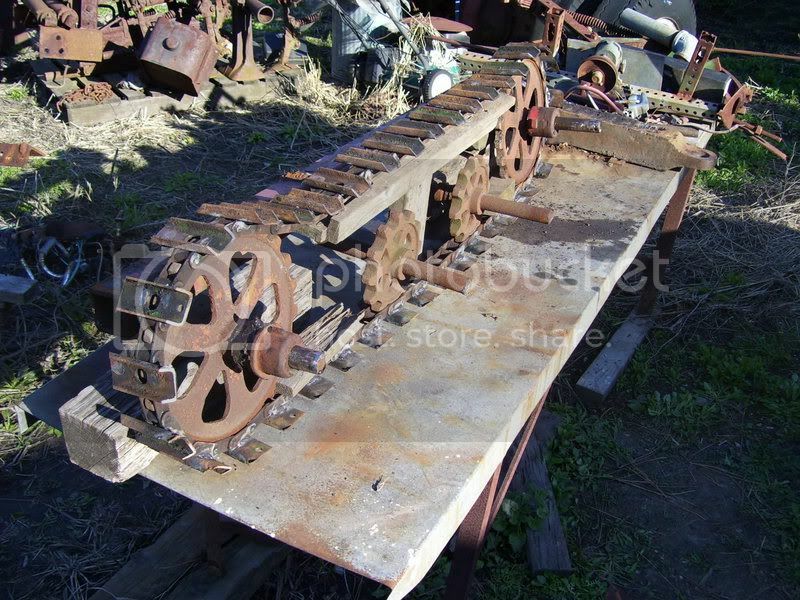 Two strips wide on each side, connected with small metal channel, angle iron or even 1x2 wooden cleats forming the drive links as well as spreading the belt width. I bought the transaxle off an old massey fergusen garden tractor to provide for not only differential but 3 speed forward as well as reverse. (Actually a Peerless 1201 gearbox). For engine I bought an electric start 13hp 390cc Chonda clone and a Chinese copy of a Comet type 40 torque converter. The Jonsered Iron horse uses a 9hp engine. Only things I was lacking was conveyor belt material and inside track wheel guides (bolt to inside track adjacent each outside cleat). I was going to build my own drive sprockets. Just a few ideas for you. If you were located anywhere near me (SW Utah) I'd offer you a great deal on what I'd gathered so far... as I don't know if I will ever be in a position to use them myself now. Last edited by Doc; 01/27/2019 08:16 PM. Sonny a good hydraulic motor Ive used is a CharLynn 104-1028, as I remember its a 18cu motor..depending on your final drive ratio,even one of these motors would pull your machine around no issue.You could drop back in motor Cu size and gain some RPM/speed at the expense of less torque. This one does have a case drain(hose line from the hyd motor directly back to the hyd tank) so you can use it at max pressure-motors like this pop up on eBay new and used, The Charlynn motors have different series designations, 2000, 4000 series, 6000 series,10,000series, -as you go up they get more powerful(and expensive)-My mini articulated loader still on my first one, a 2000series hyd motor, after 10years of abuse,and which its a used motor, and I have a spare on the shelf..were you going to do a single motor drive or two-one for each track? you could do seperate motors for each track and steer with a valve-maybe control the valve with your feet?, or do one motor and use track brakes to steer-albeit a bit jerky and less precise.-If you do two motors you could also pivot turn-counter-rotate the motors to spin turn the creeper in its own radius.Use two valves-one for each motor- And dont worry about all that motor valve horses#$t just use regular hydraulic valves to run the motors,with all that gear reduction itl stop on a dime easy. -I think you'll need both hands to cultivate and steer with your feets-leaving both hands free..If you do go hydraulic drive,get a two0section pump,it never hurts to have a spare pump circuit for a future accessory or just use it for a cooler circuit to cool and filter your drive oil. a 25hp oughta drive this machine no issues-maybe even less- as long as you arent pulling implements. And dont forget to put a cupholder somewhere for that barleypop. Last edited by bunkclimber; 01/29/2019 08:17 AM. Kinda wanted to go with a dual hyd drive and have a flow control valve in line to vary the speed. I can take one off of a Vermeer unit that I have. could also get pumps/motors/etc. if needed. I also have a few char-lynn hyd. motors on hand, one is new.